an addendum to their objection to planning application 18/00140/MAO to build 250 houses on the same land west of Gold Lane. If you haven’t already objected to policy 19, please do so now using this quick and easy to use link: http://www.have-a-say.co.uk/bpc-policy19. And if you haven’t already objected to the planning application to build 250 houses west of Gold Lane (18/00140/MAO), please do so now using this link: http://www.have-a-say.co.uk/1800140MAO. Please continue to share these links widely. The Friends of the Biddenham Village Pond have submitted to the Borough Council today their response to the Local Plan 2035, seeking the removal of policy 19 from the Plan. If you haven’t already objected, please do so now. If you have objected, please encourage all the other adults in your household to object using the quick and easy links above: to ensure every objection counts as a separate objection, please each adult member in a family use your own separate social media or email account to make your objections. And please continue to forward the links to family, friends and anyone you know in Biddenham, the local area and further afield, and encourage them to object too: share the links as widely as you can. The Biddenham Society has submitted the following objections to Policies 19 and 23 (which relate to tracts of land west of Gold Lane and on the north side of Bromham Road close to the bridge) of the draft 2035 Local Plan, and has requested the policies are withdrawn. This area of land is currently protected by Policy AD43 (Urban Open Spaces and Gaps) of the Borough’s Allocations and Designations Plan. Policy AD43 identifies urban open spaces as those ‘which have particular importance in maintaining the function, character and identity of the urban area’. It specifically highlights the need to preserve ‘visual breaks to safeguard local distinctiveness including views (particular areas of importance around Elstow and Biddenham have been identified as gaps)’. It further states that ‘Development will not be permitted on land designated as urban open space and gaps unless it can be demonstrated that the reasons for designation are not compromised or that other material considerations outweigh the need to retain the urban open space and gaps undeveloped’. This policy (AD43) supports the most recent inspector’s report on this area which relates to an application from Wimpey Homes Holdings to ‘Allocate 18.61ha of land at Gold Lane, Biddenham for some 350 new dwellings on 10ha of net developable land with generous landscaping’ (May 2001 Inspector’s Report on the Bedford Borough Local Plan, page 116 section 4.2.27). He concludes that ‘Development of the scale proposed would seriously diminish the visual attraction of the village edge’, and that ‘By extending north-westwards over what is now a relatively wide rural landscape, it would much diminish the separation between this fringe area of Bedford and the nearby village of Bromham’. The Inspector’s conclusions are as valid now as they were in 2001. In the intervening period the only change on this site has been the replacement of a single derelict barn at the end of Duck End Lane with a new dwelling, otherwise the entire area is in exactly the same condition as before, and remains undisturbed agricultural land. Whilst the current proposal in Policy 19 is to develop only 160 dwellings compared to the 350 on which the inspector ruled, his conclusions are equally valid when applied to this lesser number. Firstly, a smaller development will still impact significantly on ‘the visual attraction of the village edge’ as he states, and secondly, confining 160 dwellings to the north-east of the site does not negate the inspector’s concern of closing the gap with Bromham by extending the village north-westwards. 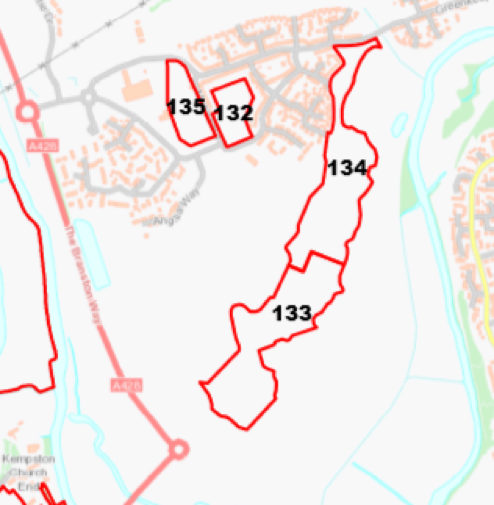 The development of 160 dwellings in Proposal 19 is certainly in conflict with the existing Policy AD43, and it is difficult to conceive how one could dispute that this development would have a serious negative effect on ‘maintaining the function, character and identity’ of Biddenham. Further, the local authority cannot argue that ‘other material considerations outweigh the need to retain the urban open space and gaps undeveloped’ as Bedford Borough has many more sustainable and brown-field sites that could be developed for the 160 properties proposed here. Proposal 9 is also flawed on practical grounds. There is no safe vehicular access to and from the section of the site identified, with any chosen exit onto Gold Lane raising the prospect of a significant increase in traffic through the centre of the village. Local schools are not equipped to handle the increased numbers of school-age children which will result from new housing of this magnitude, the education service already being under pressure to cater for the extra demand resulting from the large building programme north of Bromham Road. The Biddenham Society therefore urges Bedford Borough to delete Policy 9 from the 2035 draft Local Plan. Defining the site as open countryside within the context of Settlement Policy Areas, with future development only being permitted if consistent with national policy, in particular PPS7: Planning and the Countryside. There have been no changes to this area of land since the above two plans were approved, the most recent application for development (16/00737/MAO) being withdrawn following widespread opposition, including from the planning authority. It is therefore difficult to understand why there should be a reversal of policy as the earlier objections still apply, especially when the relatively small number of dwellings that can be accommodated could be built on more suitable sites available elsewhere in the borough. The destruction of the beautiful vistas to and from the bridge and the mill. delete Policy 23 from the 2035 draft Local Plan. We’re conscious you’ve already received a lot of information in the last few weeks about the threats facing Biddenham. Please though do bear with us and carry on reading here about the actions you can take to combat these threats before it’s too late: the clock is ticking! And please do share this as widely as you can, with its quick and easy to use links below, to enable as many people as possible to take action too. Bedford Borough Council wants to destroy precious remaining open spaces around Biddenham. It’s doing this by introducing policies into its new Local Plan 2035 that will allow development on those open spaces, which will have developers rubbing their hands with glee. We cannot overemphasise the importance and significance of these policies being removed from the Local Plan so that the few open spaces still left will remain protected. We urge you to object to the introduction of these new policies before it’s too late and Biddenham and surrounding communities become progressively merged in an urban sprawl. There are links below to do that quickly and easily. We cannot overemphasis as well the need for a massive number of objections to be made to these policies – many, many hundreds, and we’re not there yet. We must redouble our efforts and all do all we possibly can to work towards that end in the days that remain. To ensure every objection counts as a separate objection, please each adult member in a family use your own separate social media or email account to make your objections. We know that new houses need to be built for the growing population and for our children as they seek their own first homes. Our objection to these policies is not Nimbyism. There are plenty of more sustainable and brown field sites in the Borough which should be prioritised: there is no need to build on these few remaining open spaces. And it’s a fact that the parish of Biddenham has already made in recent times and is still making an enormous contribution to the provision of new houses, probably more than its fair share: think of the Biddenham Turn estate, Deep Spinney, Great Denham now hived off but still building, and the western end of King’s Field, still building. Great swathes of open space lost, and gone forever: little precious open space left. If any open space is to remain not concreted over, building cannot continue unchecked. We must protect and conserve what remains of our natural environment and the wide ranging benefits derived from it for the health and wellbeing of this and future generations. Anticipating these new Borough Council policies one developer, as we know, has already applied to build 250 houses on land west of Gold Lane (application number 18/00140/MAO). Many of you have lodged your objections to that application, and thank you for that. If you haven’t objected to it yet, there is a link, with reasons, at the end which you can use quickly and easily to object. please forward the links to family, friends and anyone you know in Biddenham, the local area and further afield: share them as widely as you can. Please pass this on to them via text, Whatsapp, Twitter, Facebook and any other social media you use. And, of course, please pass on by email if you or they aren’t connected to social media. Thank you very much for caring about the environment, about Biddenham, and about its character and heritage. Lioncourt has now submitted an outline planning application (18/00140/MAO) for 250 dwellings on land to the west of Gold Lane. The urban spaces between Biddenham, Bromham and Great Denham are all currently protected by what is known as policy AD42. This is part of the Borough Council’s Allocations and Designations Local Plan of July 2013. Since 2002, national Planning Inspectors have recognised the importance of this visual separation between communities around Biddenham. This includes the land west of Gold Lane. The Lioncourt application conflicts with and is contrary to AD42; it is neither appropriate nor necessary as the Borough Council’s current Local Plan to 2021 has sufficient provision to meet the housing requirements of the Plan; it would impose an excessive burden on local infrastructure; and would create a hazardous access point onto the narrow Gold Lane, and add enormously to existing traffic problems on Gold Lane, through Biddenham, and at the Bromham Road/Deep Spinney roundabout. And the Friends of the Biddenham Village Pond remains concerned about the adverse impact on the village pond and its wildlife were there to be development of the land west of Gold Lane, not least its impact on the water table and the availability and ability of water to reach the pond from this adjacent land. It has been made crystal clear to Lioncourt that the Parish Council, the Biddenham Society, and the Friends of the Biddenham Village Pond are united in being firmly opposed to any development on this site. If the Lioncourt application is to be refused (the closing date for objections is 16 February 2018) objections are needed in great numbers, not tens, not hundreds, but even more, to demonstrate clearly to the Borough Council and the developer the strength, depth and extent of the objection to this proposed development. Please object individually. We emphasise individually because joint applications, say from a Mr and Mrs, only count as one objection. You can double that number by both submitting objections. This is a public process so any member of the public can respond. 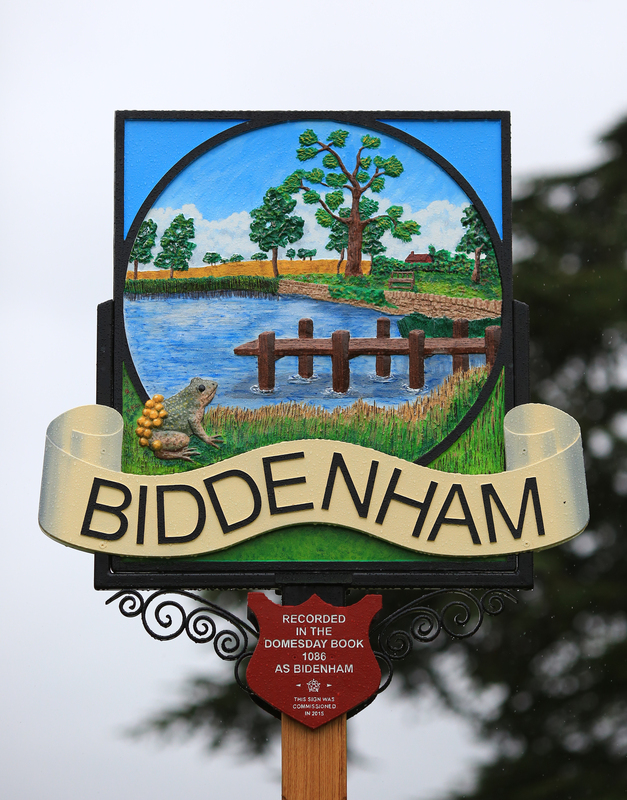 You may have family and friends who grew up in Biddenham, once lived in the village, visit the village: please ask them to object as well, and your neighbours and other members of the public too with whom you are acquainted. Very large numbers of objections are vital. If you have friends in Bromham, ask them to object too – it is equally important for them to retain the open space between our two communities to avoid the danger of coalescence and perhaps then Bromham’s eventual inclusion, like Biddenham, in the Bedford urban area. You can email your objection to planning@bedford.gov.uk (you will need to include your name and address, and of course the application number 18/00140/MAO), you can object via the Council website, or deliver your objection by hand or post to the Planning Department at Borough Hall. Remember the closing date is 16 February – don’t delay, act now. It’s up to all of us again and in even greater and greater numbers to help protect the character, setting and heritage of our village not just for today but for tomorrow and future generations. Thank you. Looking to that future, we will be contacting you again shortly about the separate but related issue of the Borough Council’s Local Plan 2035 and the need to object to policies in that which would dilute the protection of the open spaces around the village, including the land to the west of Gold Lane. A second leaflet from the Parish Council will be delivered shortly to every house in Biddenham. These are crucial times now for the future of Biddenham. YOUR VILLAGE NEEDS YOU (AND YOURS)! All homes in Biddenham will be receiving this week a leaflet from the Chairman of the Parish Council giving important information about housing development at Gold Lane. There is an imminent planning application for hundreds of houses west of Gold Lane. The Parish Council hopes villagers will help it oppose this application, once it’s made, the consequences for the village were houses to be built there being set out in the leaflet. The leaflet goes on to explain how you can help. The land in question is currently protected as green belt, but the Borough Council are publishing a housing and development plan which seeks to dilute that protection. The plan (the Bedford Local Plan 2035) is for the whole of the Borough but includes the land west of Gold Lane in what is called Policy 19 (the content of which and the associated site plan are set out in the leaflet). The public will be asked to give feedback in a consultation period starting later this month and ending on 5 March. It’ll be vital that if you don’t wish to see housing west of Gold Lane you write to the Borough objecting to this policy. The Parish Council is asking villagers please to object to Policy 19. As the leaflet explains, if the Policy is not vigorously opposed it will make the developers’ planning application easier. If it gets rejected it may well prevent the development. The Parish Council will be sending shortly a second leaflet to every home explaining in detail what to do once the period for public consultation on the Borough Council’s plan opens later in January. More than 70 residents, including our two borough councillors, attended the 53rd Annual Lunch and AGM of the Biddenham Society in the Village Hall on Sunday 5th November. Following the chairman’s welcome, the society’s secretary Mark Phillips presented and summarised the minutes of the 2016 AGM. In ‘Matters Arising’, the chairman reported on the current sale of 11 Church End, and the request of the planning authority to help monitor that the conditions attached to the use of the annexe are followed in the future by the new owners. The Treasurer Garry Fitzhugh reported a satisfactory set of accounts with the customary modest surplus. A questioner was referred to a note on the balance sheet indicating that the majority of the residual funds held were contributed by local organisations specifically for the future maintenance of the Biddenham Heritage Trail. The accounts were approved by the meeting. In his report the chairman Tony Wood reported there had been 32 village planning applications during the previous 12 months, most of which were uncontentious. He briefly reviewed the four to which the society had objected. The chairman then moved to the development of the borough’s Local Plan 2021-2035. He reminded the meeting that 10 village sites had been submitted last year for reclassification for building purposes, all of which had been opposed by the society. Most of these had recently been eliminated by the local authority, the main exception being an area bounded by Gold Lane to the east, Bromham Road to the north, and Duck End Lane to the south on which it was suggested 160 dwellings might be constructed. Whilst the society’s position remained opposed to any further development in Biddenham, the pressure on the local authority to meet its housing targets within the urban area was recognised, and the proposal appeared to be the least worst option. A meeting was held earlier in the week between local interested parties and the proposed developer to discuss this parcel of land, but to the astonishment of the residents and local councillors the developer instead presented a plan for 300 houses covering an area nearly four times that suggested by the local authority as being appropriate. This was seen by those present as a blatant attempt to drive through a mass housing scheme for the pecuniary gain of the developer and the landowners which was contrary to the interests of the village, and was vigorously opposed. The chairman drew attention to copies of the plan posted in the hall (reproduced on the Biddenham Blog), and invited Peter Chase to speak on behalf of the Parish Council. He confirmed the council’s complete opposition to the proposals, and outlined very clearly why these were at variance to decisions previously taken by the planners to preserve the physical separation of Biddenham and Bromham. There were also many other reasons why such a large development was undesirable including access, traffic considerations, school provision, and the ecological effects on the village pond. With the support of the group that had met the developer he had since written a lengthy letter to the Mayor and borough Chief Executive which listed in detail the numerous local objections to the proposal. As part of the subsequent debate and questions, Cllr Roger Rigby clarified the likely rationale of the borough in putting forward its original proposal for 160 properties on this site, and confirmed the wisdom of submitting a strong letter from the Parish Council objecting to the developer’s enhanced plans. It was stated that the developer had announced the intention to hold a public consultation in the Church Barn on 21st November. The final main agenda item was a short presentation from Chris Hayden-Jones on our local footpaths and Cowslip Meadow to which many improvements had already been made with more planned. The chairman thanked Chris for his hard work and leadership on this excellent community project. In considering membership of the committee for 2017-2018, Bob Hutchinson had indicated he would be stepping down after ten years (nine as treasurer) on the committee, and the meeting warmly showed its appreciation. The remainder of the existing committee (Will Jenkin, Mark Phillips, Garry Fitzhugh, Monica Knight, Susie Mason-Patel, Jeremy Reynolds, Chris Hayden-Jones and Tony Wood), were re-elected unanimously. The chairman closed the meeting with thanks to all the helpers preparing and serving the lunch, especially to the chief organisers Will Jenkin and Jeremy Reynolds. The next AGM will be on Sunday 4th November 2018. 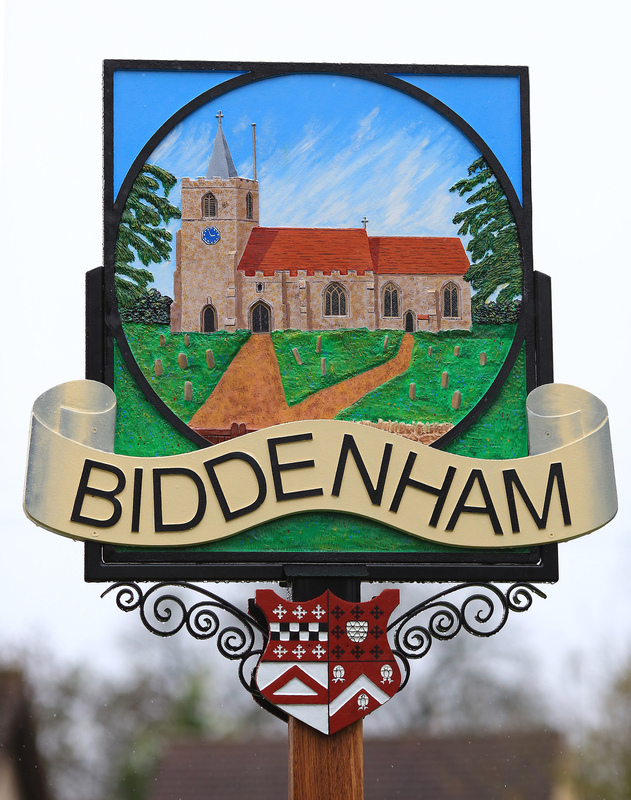 Founded in 1965 by a group of concerned residents, The Biddenham Society remains committed to the continued preservation of the beauty, history, character and heritage of the village. Bedford Borough Council is preparing a local plan that will set out how much growth there should be in the borough in coming years (housing, jobs and associated infrastructure) and where it should take place. Current planning policy documents look up to 2021 and the new local plan will extend that period up to 2035. It will also include policies that will be used to make decisions on planning applications. The Council has asked for comments on the consultation paper it has issued about the new plan, together with a number of supporting evidence documents. The consultation period ends on 9 June 2017. In the Borough Council’s consultation paper an area of land off Gold Lane, Biddenham, and within sites numbered 29 and 691 in the documentation is shown as a potential development area at this stage: that area of land is not immediately adjacent to the village pond. But in a supporting document, the current draft Strategic Housing and Employment Land Availability Assessment (SHELAA), the whole of the land in sites 29 and 691 is shown as being suitable, available and achievable for development. Our village pond is not served by streams or springs and relies on precipitation and run off from adjacent fields for its water, and importantly the entire area surrounding the pond is currently wildlife friendly. Developing all the land in sites 29 and 691, particularly the field to the north of and by the side of the village pond, between the pond and Duck End Lane, would have a significant and substantial practical and aesthetic impact on the pond. It would threaten the pond’s very survival and the survival of the wide range of wildlife it supports, including rare and protected species, by adversely impacting both run off water to the pond and also the pond’s setting in the presently attractive open and wildlife friendly landscape around it, thereby reducing the scope for and ability of wildlife to migrate to and from the pond and thus the opportunity for sustainable healthy breeding through genetic diversity with other populations. more substantially, the removal from the threat of development of the whole of the land in sites 29 and 691, south of the A4280, and its retention as open space, and similarly therefore its reassessment and recategorisation as land not suitable, available and achievable for development. 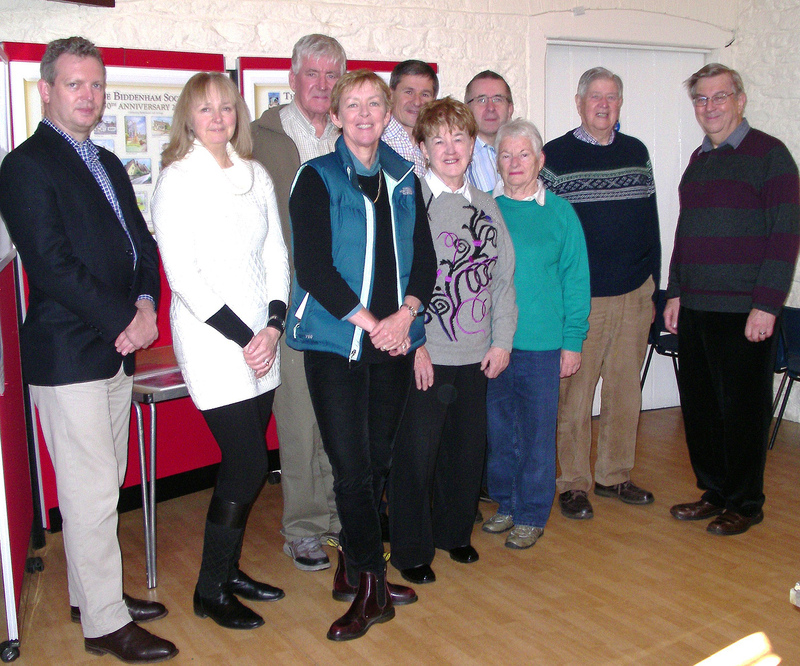 A full house of 100 residents attended the 50th AGM and lunch of The Biddenham Society held on Sunday 7 December 2014 in the Village Hall. In his welcoming remarks the chairman drew attention to the presence of two residents, David Palmer and Pat McKeown, who had also been present at the inaugural meeting of the society in 1965. The minutes of the 2013 AGM (presented by Secretary Mark Phillips) and the Balance Sheet for 2013-2014 (presented by Treasurer Bob Hutchinson) were both accepted by the meeting, the particularly healthy state of the finances being primarily due to as yet unspent lottery funds committed to the heritage trail. In his report, the chairman reported that 38 planning applications for the Biddenham area had been received during the last year, most of them relating to property extensions. However four recent submissions of particular significance to the village were worthy of specific note. i). The most recent application by the owner of 29 Day’s Lane to construct two dwellings on the site of the orchard adjoining the pavilion field had again been refused following widespread local opposition. ii). The application for retrospective planning permission by the occupant of 38 Church End for a two-storey residential barn already constructed in the back garden was refused following objections by the society, the parish council and neighbours. iii). The application to extend and re-model the façade of ‘The Firs’, 21 Church End was withdrawn following objections from the society and others regarding an inappropriate pastiche design and other factors. iv). The application to construct a large residence to the rear of ‘Lavender Lodge’, 42 Main Road is pending, but has been opposed by the society as an overdevelopment of the site and with an excessive footprint. The chairman then described the latest developments regarding the paddock between Church End and the golf course and a new form of protection for green spaces which can be shown to be special to the local community. From the floor, Pat McKeown spoke of the initiative he has launched to acquire this area presentation in trust to the village, and Cllr Jon Gambold followed with the possibility of still having the paddock accepted as an ‘Asset of Community Value’ despite the recent rejection by the borough of an application from the parish council for its designation. The chairman then updated the meeting on the by pass extension north of Bromham Road: completion by October 2016 (earlier if the weather is kind); a contractual requirement to complete the first two roundabouts in nine months giving access for housing construction; 1300 dwellings currently planned, but initial development will only be at the western end of the site; cost £8 million. This will be opened at 11.00 am on Saturday 18 April 2015 at King’s Corner, Main Road, by Alistair Burt MP. Biddenham Upper School will be providing musical accompaniment, and family trail questionnaires (with prizes) will be available. More details later. The Junior Heritage Trail, devised by pupils of St James’ Lower School, will be opened at a later date in the school’s summer term. Three excellent presentations on aspects of the heritage trail were then made to the meeting. Monica Knight discussed the history and development of the Arts and Crafts movement in Biddenham, specifically in relation to the houses of Mallows and Baillie-Scott; Peter Applewhite talked about the origins and turbulent past of the village pond and its lost dovecote, and encouraged those present to help preserve this important asset by becoming ‘friends’ of the pond; and Kathy Fricker described the work and activities of the recently-formed History Society, and its close links with the development of the heritage trail. Thanks were expressed to Averil Watson who is stepping down from the committee this year. The remainder of the committee Dr Tony Wood (Chairman), Mark Phillips (Secretary), Bob Hutchinson (Treasurer), Chris Gleave, Will Jenkin, Monica Knight, Susie Mason Patel, Dr Jeremy Reynolds, and David Slark were re-elected for 2014-2015. In closing the meeting the chairman thanked the committee, helpers and friends for their great efforts in organising the luncheon event, and especially Chris Gleave for once again masterminding the preparation of the meal.